Yeh Hai Mohabbatein Ishita tries hard to meet Raman. Raman, Shagun and Bala get finding Ishita and ask the locality people about her. They get clued about Ranbir’s hideout. They reach the house and try to find Ishita. Yug speaks to Rohan and tells him that they can’t keep Ishita with them for long. Ishita learns about Rohan, who has sent his friends to save her from the chemical factory. Rohan apologizes to Yug and doesn’t understand how Raman has reached there. He doesn’t want his name to be known. Ishita hears the guys arguing and understands that Rohan has done all this just to safeguard her. She gets a good surprise when she finds Raman there. Yug requests her not to name them and forgive them, since they didn’t intend to hurt her. Yug and friends leave from there in time. Raman manages to find Ishita and sighs a big relief on finding her safe. He gets grateful to the person who saved her. Ishita stays numb and doesn’t reveal about the guys who saved her. Raman suspects Parmeet’s involvement. Ishita tells him that Parmeet isn’t the one who kept her captive in the house. She tells Raman about the masked guys and hides their identities. Ishita returns home and brings joy in the family. Everyone gets delighted to see her and give the credit to Shagun for Ishita’s comeback. Ishita wants to know about Simmi. Raman gets Parmeet arrested for the crime of Ishita’s kidnapping. Ishita asks Raman if he is hiding something. Inspector tells Parmeet that he has got all the evidences against him. Parmeet tries to deny the blames and stop the arrest. 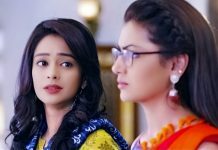 Ishita learns Raman’s hatred towards Rohan. Raman blames Rohan for fooling Simmi emotionally and making her leave the family. He tells Ishita about Rohan breaking Simmu’s heart by using Ananya’s name. Sudha tries to save Parmeet from the police. She does a favor on Parmeet so that he can help her settle her scores. Parmeet asks her to bail him out . He tells her that he can help her. Rohan tells the family that he has changed because of Simmi, since Simmi has taught him about the real worth of family. He asks Raman to believe him. Raman doesn’t believe Rohan and Karan. Ishita tells Raman that Rohan has indeed changed, since he has saved her by sending his friends on time. She makes the shocking revelation and tells the family that Rohan’s friends have kept her safe. She thanks Rohan for saving her life. Karan asks Rohan to continue the drama and protect Sudha. Rohan isn’t doing any drama. Raman thanks Rohan for saving Ishita and the lives of the family, since everyone can’t live without Ishita. Raman is happy that she is back. He wants to spend time with her. He gets into dramatic mode and asks the children to leave, so that he can sleep. Raman and Ishita share a moment. She tells him that she has a belief in him. She thanks him for his efforts to save her. She hides the truth about Yug so that Yug and his friends don’t fall in trouble. Raman decides to hire a bodyguard for Ishita. He worries for her security. He tells her that he is really tensed for her. She doesn’t want any security. Yug and his friends chill out after a long time. Ishita doesn’t want Raman to meet Yug ever, since that would freshen Raman’s wounds about Adi’s death. Yug gets a big order and gets delighted to join Pihu industries. He turns happy. He learns that its Raman and Ishita’s company. He feels the job offer is some kind of trap. The Bhallas will be coming face to face with Yug.